One of the best ways to choose a car seat is to buy a seat based on the age of your child. No matter their size, different aged children require different things from their car seats. There are a number of convertible car seats on the market that promise to safely hold a child from birth until childhood. These seats, however, often fall into the problem of trying to do too much at once. The safest option for buying a car seat is to buy one that is specifically designed for your child’s age. Because of their various stages in development, babies need specific support and protection from a car seat that often cannot be found in a convertible seat. While there are some excellent convertible seats on the market, they often fail for one of the age groups. Whether it be a problem with the padding or with the angle, they simply cannot accommodate every age child perfectly. Child safety and comfort are the most important things in a car seat. Finding an age appropriate option will fulfill those two goals well. There are three stages of car seats for your child to advance through. The first is the infant car seat, then the front-facing seat, then the booster seat. The main trade mark of infant car seats is that they sit rear-facing in the backseat of the vehicle. This is because rear-facing seats are meant to support the spine and head and distribute crash forces across the seat in the event of an accident. Since infants cannot hold their heads up using their own strength, it is also important to find an infant seat with good padding. Some seats with inadequate padding force the baby’s chin to their chest which can close airways. Make sure to look out for that uncomfortable position. Another hallmark of infant seats is that they are usually comprised of a base that remains in the car at all times and a carrier which can be removed and carried separately. The carrier is an important part of infant seats as it allows you to take the baby inside without waking them up. Rear-facing infant seats, depending on the brand and weight restrictions, usually can be used from 0 to 10 month old babies. This gives the baby enough time to grow and strengthen for the next stage. According to the American Pediatrics Association, children should actually stay in a rear-facing seat until they are at least two years old. The best way to accomplish this is to get a seat which can be installed in both positions. While convertible seats are often problematic for infants, they can work perfectly well for slightly older children. Since a child can usually support their own heads by that point, the head support and padding is less of an issue. After your child has reached the weight or age limit for rear-facing car seats, you can easily switch to a front-facing position with a convertible seat. A child should stay in this position until they either reach the weight limit or four years of age. Front-facing seats, unlike booster seats for older children, still incorporate a built in harness. This ensures that the straps fall in the correct places over the child’s chest. At this age, a regular car seatbelt would not fall correctly and therefore no protect them well in a crash. When your child has reached at least four years old, they are old enough to move to a booster seat. This will be the last stage for a child’s car seat days. When your child graduates to a booster seat, they will no longer have a built-in harness with their seat; you will use the regular seatbelt. The main goal for a booster seat is to provide the best placement for the seatbelt across the child’s check and lap. At the beginning of a child’s time in a booster seat, the high backed versions are the safest. This is because they close the gap between the back of the vehicle’s seat and the child’s spine. For older children (or children who are tall enough), you can purchase a simple base-only booster seat. These seats are typically much more portable and light weight, which also makes them a great option for parents with multiple vehicles. All booster seats should be used in the backseat of the vehicle until the child is at least thirteen years old. Airbags in the front seat of a vehicle are at the wrong level for children and can be light threatening. The main thing to look for when choosing a booster seat is that it directs the seatbelt correctly. The belt should sit low across the upper thighs and across the chest and shoulder while not touching the neck. Your child has outgrown the booster seat when they can sit on the seat of the car with the seatbelt in the proper place. At this point, the child has graduated from car seats. This graduation tends to happen around 10-12 years old. According to the American Academy of Pediatrics, children should be in rear-facing car seats until they are at least two years old. Studies have shown that this age requirement improves a baby’s chances by 75% in an accident. 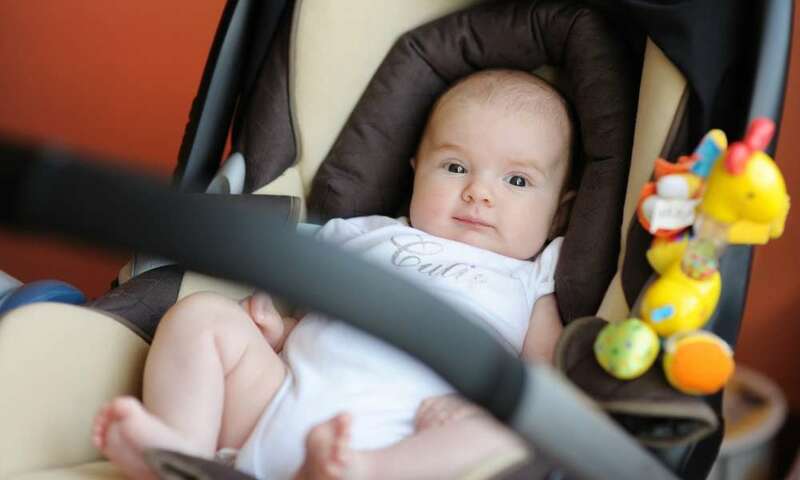 While they do not have set age recommendations for front-facing car seats, the American Academy of Pediatrics does recommend that children stay in a booster seat until age 8-12. This ensures that the seatbelt does its job correctly during an accident. Although choosing a baby car seat by age is a great way to find the perfect and safest fit, also keep in mind the weight restrictions of a given seat. Even if you child is under 2 years old, it they have outgrown the weight restriction, the rear-facing seat will not be safe. The top thing to remember when choosing a baby car seat by age, is that a child should be rear-facing till age 2 and graduated from their seat by age 12. This provides a good framework for purchasing the perfect seat for your child’s age.